One of the Leading Bonding Systems! 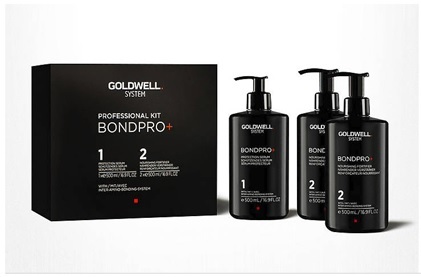 Bond Pro is a special additive used with chemical services such as color, lightening and straightening services. It can also be used as a stand-alone repairing treatment for over processed, distressed hair. It uses a BondPro+ Inter-Bonding-System that is based on an advanced amino-acid formula in combination with moisturizing panthenol and cationic polymers. STEP 1: Protective Serum – penetrates the hair and protects the hair fiber from within during the lightening, coloring or texturing process. As a result, this prevents hair breakage and damage. STEP 2: Nourishing Fortifer – a rich, intensive treatment which reinforces the bonds in the hair. We would strongly recommend this service for anyone having a dramatic colour change. Especially if you are going from dark hair to platinum or vice versa. This service will be just what your hair needs to repair it from the strain of the chemical process. Ask us about this amazing service at your next visit, we love it!